Help CentreSuperControl AGENCY features Paying ownersHow do I pay an owner monthly? 3. Scroll through your payments and ensure everything you wish to pay to the owner is ticked within the “Mark paid” column. 4. The tick boxes will create a payment amount for you at the top of the page. DO NOT manually amend the payment amount as it will auto-calculate the payment amount based on the payments ticked within the statement. 5. Ensure “Payment to owner” is selected and enter a caption e.g. “August payment”, then enter a payment reference and the date you are paying the owner. 8. Now you need to physically pay the owner the money they are owed. 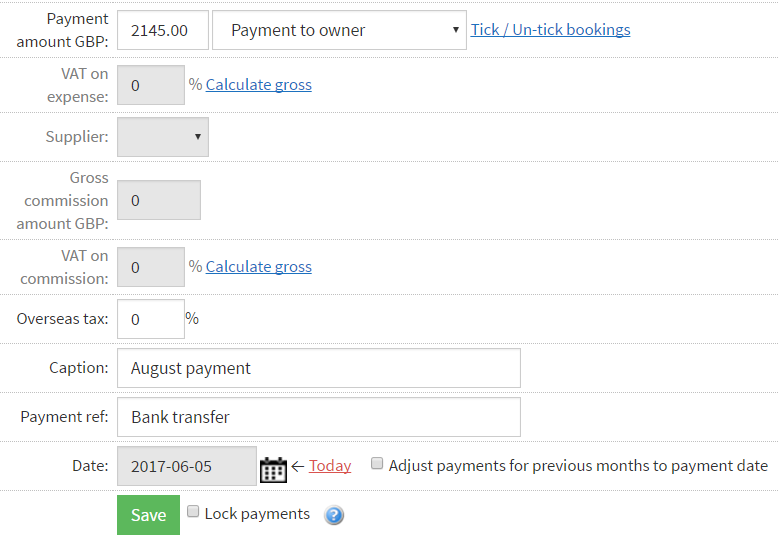 Prev: How do I add an expense to an owner? Next: How do I pay all owners in bulk?